WaveDNA is excited to announce a significant update to the full version of Liquid Rhythm beat generation software, including powerful new MIDI sequencing and editing tools to create and remix drum patterns. This can now be achieved either directly in Ableton Live clips via Max For Live, as a Plug-In, or as a stand-alone application. Additionally, the company has released Liquid Rhythm Intro, a condensed version of Liquid Rhythm to increase accessibility for electronic musicians, music producers, composers and DJs. Boasting a redesigned user interface and a host of new features, Liquid Rhythm enables increased workflow efficiency by shortening the time users spend composing and searching for the most suitable rhythm. It analyzes MIDI data and suggests complementary beats. This allows users to quickly complete their productions or go in new directions without having to change the entire structure and notation of the piece. Liquid Rhythm’s newest software update allows users the ability to quickly access literally ten quadrillion rhythmic patterns, import pre-existing MIDI tracks created using their DAW of choice, and mine their huge library of loops and kits to quickly and easily create rhythmic compositions. Liquid Rhythm’s newest software update allows users the ability to quickly access more than ten quadrillion rhythmic patterns, import pre-existing MIDI tracks created using their DAW of choice, and mine their library of loops and kits to quickly and easily create rhythmic compositions. Learn more about Liquid Rhythm’s main features below. New: Ableton Live users can use Liquid Rhythm’s MIDI sequencing and editing tools directly in Ableton Live clips via a Max4Live patch. Seamless integration between the software applications improves production workflows. New: Intelligent Randomizer: Create drum tracks and fills by generating combinations of rhythm patterns from a library of presets. New: BeatBuilder: In a single click, populate multiple bars with the beat of your choosing from palettes of rhythm patterns. Easily experiment with variations using a sequencer that swaps individual notes with clusters of notes. Instantly switch to a shuffle, double-time, or half-time feel. New: GrooveMover instantly rearranges groups of notes by switching underlying accent patterns to discover and explore new musical ideas. Updated: Accent Modifiers allows users to adjust the velocity and groove of multiple notes simultaneously according to the Music Molecule’s color-coded accent patterns. Updated: In-Line Molecule Editing gives users the power to edit MIDI notes directly in the arranger. 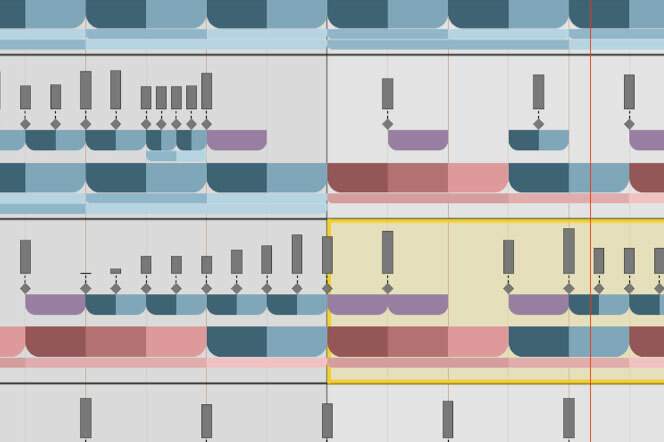 Music Molecules are updated in real-time around all note edits. The Music Molecule is a new way to represent MIDI. It uses color-coded patterns to group together and show relationships between notes. This provides the power to access and edit multiple notes simultaneously. Molecule Maps allow users to build beats in one or two clicks. BeatSeeker gives users the ability to find and use rhythm patterns that are common in specific genres. BeatWeaver Rhythm Synthesizer creates and remixes drum tracks by exploring an extensive list of pattern variations across a bar of music. Running on both Mac and Windows platforms, Liquid Rhythm is VST/AU/RTAS compatible and works as a plugin or standalone software. It comes with a Media Library of percussive samples, drum kits and loops, and allows users to import custom samples. Sold direct from WaveDNA.com, the full-featured Liquid Rhythm software is $129 USD and Liquid Rhythm Intro is $49 USD. A 30-day Free Trial Version is also available for download at www.wavedna.com. WaveDNA is a Toronto-based music software development company started by co-founders Doug Mummenhoff and Dave Beckford with the goal of designing and building the next generation of innovative virtual software instruments, including their first software release Liquid Rhythm – a MIDI sequencer and beat generator for electronic musicians, music producers, composers and DJs. The full-featured Liquid Rhythm software is $129 US and Liquid Rhythm Intro is $49 US. Click for more. Try Our Beat Generating Software!